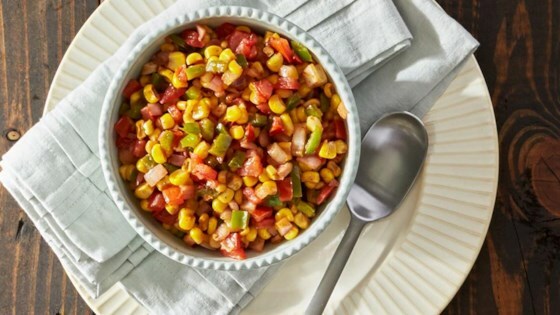 "A great veggie side dish for any barbecue, spicy whole kernel corn is baked or grilled in a foil packet with onions, tomatoes, and green bell pepper." Center vegetables on sheet of Reynolds Wrap(R) Aluminum Foil. Sprinkle with Cajun seasoning; stir to blend. Top with margarine. Bring up foil sides. Double fold top and ends to seal making one large foil packet, leaving room for heat circulation inside. Bake 20 to 25 minutes on a cookie sheet in oven. See how to make foil packets for cauliflower & red bell peppers in cheese sauce. My company didn't think it had much flavor for the amount of chopping etc that had to be done. Great side dish, though i added a few more spices to it and a little extra cajun for some flavor! This was so good I couldn't get enough of it. So easy to make.